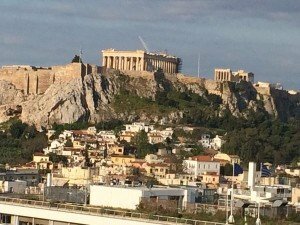 Letter from Berlin: Quo Vadis, Greece? James Angelos, The Full Catastrophe: Travels Among the New Greek Ruins (2015). Berlin — The Sunday evening (July 5, 2015) that Greek voters delivered a resoundingly loud “No!” — 61 per cent marked “Oxi,” Greek for “no,” on their ballots in a national referendum — against proposals to impose further economic austerity programs on their depression-battered nation, a European heat wave broke. In Berlin, the temperature that day was 38 degrees Celsius; in other parts of the Continent — France, Italy, Switzerland — the heat had reached 40 degrees during the preceding week (hardly anything compared to the 45-50 degree deadly heat in places like Pakistan, but hot for northern and central Europe). 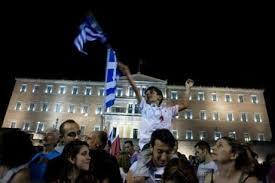 Referendum celebration in Athens, July 5, 2015. A couple hours before midnight, even as living room TV, computer and smartphone screens showed momentarily jubilant Greek crowds in front of the parliament building in Athens’ Syntagma Square celebrating the somewhat surprising outcome of their referendum (pollsters had predicted a too-close-to-call result), a magnificent storm broke over Berlin. There was lightning, thunder, wind whipping the courtyard trees, and a deluge of rain falling through the darkness, as people stood on their balconies in summer shorts (and less) to get a taste of the relief. It felt like an ecstatic pagan moment, Zeus unleashing a populist thunderbolt to rend the oppressive sky and let in a breath of fresh air. It was tempting to welcome the stormy weather in Berlin as a romantic metaphor for what was happening in Athens to the south. But in real unromantic life, the weather quickly returned to the usual summer ups and downs that we discuss around the water cooler or cafe table. And in mundane political reality, precisely one week and a night shift later — prime ministers of the 19 Eurozone countries that use the euro as their common currency had gathered in Brussels, and debated the state of Greek finances all through a mid-July night — there was a shockingly harsh turnaround. 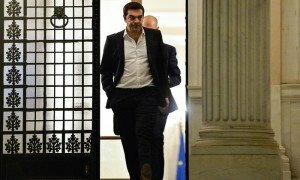 The Greek government of 40-year-old Prime Minister Alexis Tsipras and his left-wing Syriza Party was presented with, and very grudgingly accepted, an even more draconian austerity program than before in return for talks on a new fiscal bailout plan for an Aegean nation whose banks were closed and that was on the verge of complete fiscal collapse. How did Greece go from a “We’re mad as hell, and no, we’re not going to take it anymore” moment to a humiliating parliamentary acceptance of more of the same? How did a left-wing government, whose ranks include Marxist economists and populist tribunes of the people, end up imposing the latest austerity deal? Obviously, the Greek crisis of recent years didn’t happen overnight. 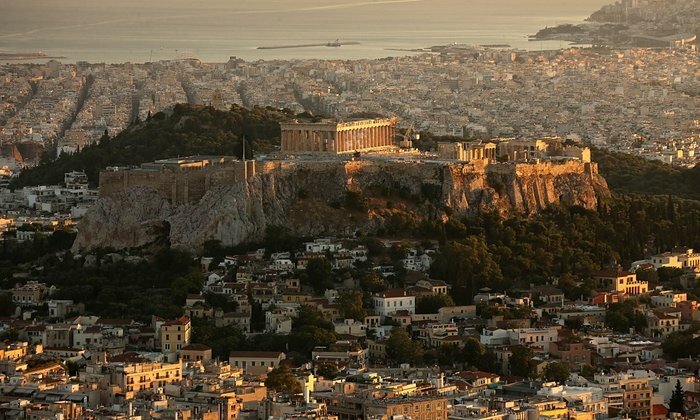 Greece had been plagued over the last half-century by incompetent governments and corrosive corruption, under the aegis of both right-wing and social democratic regimes (to say nothing of military coups). But it was the United States-sparked global economic catastrophe of 2008 that spelled disaster for the Hellenic country of 10-million people in southern Europe, and revealed the full fragility of its economic structures. Although contemporary Greece was never a rich society, it nonetheless had a middle-rank economy among European Union (EU) nations, and a standard of living higher than many of the former Soviet bloc countries that have subsequently joined the European ensemble. Or it did, until the crash of 2008 and the resulting “austerity” program meant to rescue Greece from impending bankruptcy. The capitalist crash left “distressed” and battered national economies wherever the tentacles of “globalization” reach. In Europe, the distressed economies included those of Spain, Ireland, Portugal and Italy, among others. But the most troubled of all is Greece, where more than a half-dozen years after the economic implosion, the country suffers from 25 per cent depression-level unemployment (over 50 per cent among young people), a GDP that has shrunk more than a quarter from pre-crash levels, and that now has a third of its population living on the edge of or below officially designated poverty lines, with whole families, including adult children, living on one elder family member’s pension. Don’t let your eyes glaze over as you look at those numbers. That’s 25-per-cent- and-counting unemployment. At the end of January 2015, Greek voters decided they had had enough. In national elections, they turned their backs on traditional parties like the right-of-centre New Democracy and the social democratic Pasok party, both of whom had governed since the crash. Instead, in the first ballot box revolt in post-crash Europe, the country gave a stunning victory — a near-majority of 149 out of 300 seats in the Greek parliament, and a 36 per cent plurality of the vote — to Syriza, an openly left-wing political grouping. Syriza quickly formed a majority government in coalition with the rightwing but anti-austerity Independent Greeks (Anel) minority party. The distribution of opposition seats, besides the traditional parties and a new centrist grouping charmingly named The River (To Potami), included the old Communist Party of Greece, and the openly fascist party, Golden Dawn, which received a little over 6 per cent of the vote in the fractious 7-party parliament. “To understand the political earthquake in Greece” that brought Syriza to office, wrote Nobel Prize winning economist and New York Times columnist Paul Krugman in the immediate wake of the January election, he suggested not only that we look at the first European government “elected on an explicit promise to challenge the austerity policies that have prevailed since 2010,” but especially at the austerity deal itself. That is, the terms of the 2010 “standby arrangement” or “memorandum” that brought Greece seemingly urgent IMF and other EU loans in return for austerity and promises of reform do much to explain what happened at the ballot box. “What went wrong?” Krugman asked. “I fairly often encounter assertions to the effect that Greece didn’t carry through on its promises, that it failed to deliver the promised spending cuts. Nothing could be further from the truth. 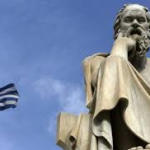 In reality, Greece imposed savage cuts in public service, wages of government workers and social benefits.” Despite all this, “Greek debt troubles are if anything worse than before the program started.” For one thing, the economic plunge reduced revenues. Although the government collected a higher share of GDP in taxes, GDP fell so rapidly that the tax receipts declined. As for the ballyhooed billions in bailout to cover Greek debts, it’s often forgotten that those billions of euros didn’t go to Greek citizens through economic stimulus, they went to creditor banks, located in France, Germany, Greece, and elsewhere. The claim that “the direct job-destroying effects of spending cuts would be more than made up for by a surge in private sector optimism” proved false. 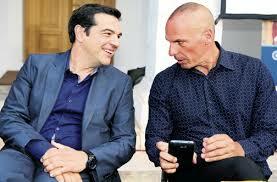 Tsipras (l.), Yanis Varoufakis (r.). 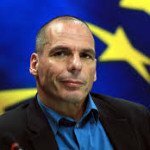 Instead of following Krugman’s sensible advice, European officials doubled down on the lectures to “act responsibly” as the Greek prime minister and his finance minister, Yanis Varoufakis, went on a tour of European capitals throughout the month of February, seeking support for an end to austerity. Although various European heads of government, particularly French president Francois Hollande, mumbled occasional sympathetic homilies, the main message was, Beware of Greeks bearing debts. 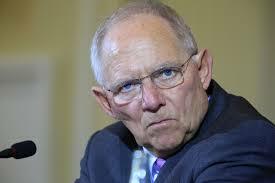 The coldest shoulder came from German finance minister Wolfgang Schaeuble, one of the architects of the austerity program, who, on behalf of German chancellor Angela Merkel’s conservatuve government, demanded that Greece pay its bills, clean up its act, and impose more discipline and austerity. Other leading European economic figures, such as IMF director Christine Lagarde and Dutch finance minister Jeroen Dijsselbloem, who chairs the Eurogroup, a meeting of Eurozone finance ministers, were hardly more helpful as they dismissed the arguments of the new Greek finance minister, Varoufakis, an economics professor at the universities of Athens and Texas, and the author of The Global Minotaur: America, Europe and the Future of the Global Economy (2013). The four-month period from the February extension of the rescue program to the July referendum was marked by an air of continual crisis, countless “final deadline” late-night meetings that never produced finality, and an emerging hardline EU position, led by Germany’s Schaeuble, that insisted that only a program of more austerity was on offer if the Greeks wanted additional fiscal relief. The inconclusive negotiations, the spectre of recurrent deadlines (usually having to do with Greek repayment due dates), and the bland intransigence of the creditors made the actual economic situation in Greece that much worse. More small businesses closed as worried customers hedged on purchases; tax receipts declined, reducing the government’s ability to manoeuvre; direct suffering increased (in terms of access to food, electricity and other daily necessities); eventually banks closed, while imposed capital controls restricted daily ATM withdrawals to 60 euros. Finally, the unrelieved uncertainty was stressful and demoralising to the populace. What went on in the closed-door negotiations is a matter of interpretation and speculation. The contempt of the European institutions for the “inexperience,” “amateurishness,” and “naivete” of the new Greek government oozed out at every opportunity. 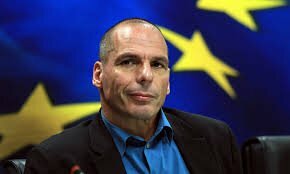 The most maligned person of all was Greek finance minister Yanis Varoufakis, a telegenic, outspoken, rather unusual political figure who enraged other Eurozone finance ministers. 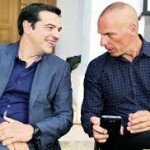 Even Varoufakis’s sartorial style — the absence of standard buttoned-up suits and ties in favour of informal open shirts, which the Syriza government had adapted from the day of its swearing in — marked him off from his more conventionally attired fellow ministers. He was accused of “flamboyance,” “lecturing” his colleagues, and a tendency to stick the finger to people who thought they were owed subservience in addition to debt repayment. 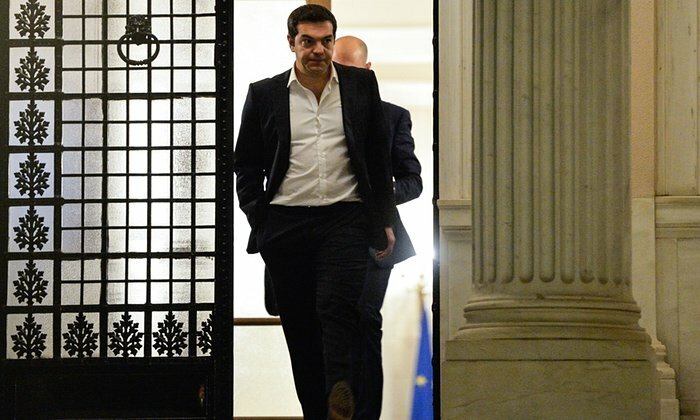 In the end — or perhaps we should say in the middle of the muddle — Tsipras and Syriza made a surprise move. Faced in late June with the latest unbudging EU proposal for an agreement, Tsipras announced that the deal would be put to the Greek people in a referendum for a yes or no vote. Observers were quick to note, with irony intended, that in the land of the mythic birth of democracy, the government had decided to try something new — namely, democracy. The Eurozone representatives were infuriated by the Syriza decision, and many of the comments of EU officials could be read as an open call for “regime change.” Within Greece, the mainstream opposition parties and press quickly lined up for a “yes” side campaign, while Tsipras led the call for a rejection of the most recent austerity proposal, and finance minister Varoufakis vowed to resign in the event of a yes vote. There was a heated week-long run-up to the vote, featuring rival street demos, a deluge of competing TV and newspaper op-eds, and the sense that at the very least this was a moment of Greeks deciding something for themselves rather than being subject to bullying outside ultimatums. On the night of July 5, as we know, the storm broke and Greek voters, especially young people and workers (according to post-referendum surveys) decisively voted “No” by a 61 per cent majority. What we don’t really know is what the voters intended by saying no, and what the leftist government understood the vote to mean. The ambiguity goes back to Syriza’s stunning election victory earlier in the year. Again, there are questions about the mandate the leftist government was given. Some of that ambiguity is understandable, given that Syriza is not a centralised party but a disparate coalition of leftist groups, includng a “Left Platform” caucus that includes such prominent economists and political theorists as then energy minister Panagiotas Lafazanis; Stathis Kouvelakis, a member of Syriza’s central committee; and Costas Lapavitsas, author of The Eurozone in Crisis (2012) and, with German economist Heiner Flassbeck, Against the Troika: Crisis and Austerity in the Eurozone (2015). We know that Syriza’s “Thessaloniki Programme” of late 2014 called for massive debt write-offs, and remaining repayments to be based on future economic growth, as well as significant easing or reversal of the austerity measures and a major public investment/stimulus program. All of this was envisaged as occurring through “hard” negotiations with the EU institutions, and assumed that Greece would firmly remain within the Eurozone monetary union. What referendum voters intended was clearer at the macro level, but less certain in practical terms. What many Greeks wanted was to simply utter a giant, unequivocal “No!” to the European powers-that-be, both as an expression of the popular will against austerity and as a form of catharsis in the face of much disrespectful stereotyping (and “scariotyping”) of the Greek populace as “lazy,” “feckless,” and lolling about in undeserved early retirement on their jewel-like Aegean islands. What was far less clear was, Did the public No also mean a willingness to exit the euro, re-establish a drachma currency that could be attractively devalued, and to sail upon the uncharted waters of debt default and an unprecedented withdrawal from one of Europe’s central institutions? The evidence we have from subsequent events suggests that a plurality of referendum voters were saying No to more austerity, but Yes to continued membership in the Eurozone. The desire may have been contradictory, but there’s no requirement of referendum voters that their desires be coherent. Syriza leftists tended to view the powerful No result as a surge of class and generational consciousness that could have permitted the government to embark upon a truly radical program of bank and other nationalizations, popular self-help economic programs, and something approaching the look of genuine socialist aspirations. If anyone thought that the No referendum and Varoufakis’ resignation would mollify the Eurozone ministers — and there were several pundits who did — they were mistaken. Tsipras was apparently not one of those who saw a rosy dawn the morning after. In the week that followed, not only were the remnants of any conceivable socialist dream vaporized, but the reality of renewed austerity thudded down amid the closed bank doors, threatened foreclosures, and restricted cash machines. Still, many observers were retrospectively surprised that Syriza apparently didn’t have a Plan B, in case Greek creditors didn’t relent. As economist Paul Krugman told a CNN interviewer (on July 20), “It didn’t even occur to me that they would be prepared to make a stand without having done any contingency planning… Amazingly, they thought they could simply demand better terms without having any backup plan,” namely, a Grexit strategy. More interesting was the question of why the alternative plan wasn’t implemented — and why Tsipras didn’t take the possibility of Grexit more seriously.Instead, Tsipras immediately proposed to the EU authorities a deal that appeared to accept most of the strictures that the Euro ministers had insisted on for months, and even brought in a team of French technocrats to polish the language of the capitulation. While insiders and mere observers argued over whether Tsipras’ actions constituted a complete U-turn, “betrayal,” or pragmatism in the face of hopelessness, the down-to-the-deadline negotiations continued in Brussels. A few vague sentiments were uttered about “debt relief,” but nothing was put on paper, despite an IMF report that appeared in the midst of the negotiating frenzy declaring that any deal that failed to include substantial debt write-downs would be unworkable. The IMF report, confirming what Greek officials had been saying for months, was seen as a move by the U.S., which has significant influence within the international fund, to signal the Obama administration’s support for a less onerous bailout package. In any case, what to do about the unpayable debt was left to future considerations. One other report that surfaced during the final hectic moments was from the German finance ministry, and was apparently backed by Schaeuble. It floated the notion that Greece take a “temporary exit” from the Eurozone, even though Eurozone rules, which Schaeuble had so assiduously defended, makes no provision for such an innovation. This was perhaps the one moment when the views of the conservative German finance minister and the socialist wing of the Greek government temporarily and somewhat bizarrely coincided. 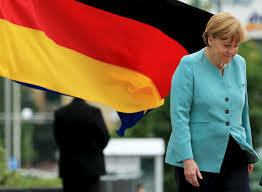 The official Greek delegation to the negotiations, however, was committed to staying in the Eurozone. The Greek parliament was given 72 hours to approve the deal. Tsipras and his new finance minister returned to Athens and told the parliament that they personally thought it was a “bad deal” that wouldn’t work, but nevertheless urged the legislative body to support it for lack of any practical alternative. Some 40 MPs from Syriza’s 149-member contingent, including former finance minister Varoufakis, cast another No vote, but Tsipras had an easy majority consisting of the bulk of his Syriza colleagues, as well as Yes votes from the mainstream opposition parties. A week later, the parliament was required to pass a second package of pre-condition legislation and again did so after another long, hot night of political rhetoric as normal summer temperatures in Athens pushed 40 degrees. This time, not even thunderstorms would provide either metaphors or relief. In the days after the deal was sealed there was a bit of blowback directed at the over-bearing Germans, both from inside and outside Germany. On late-night German TV, two young comedians performed a skit in which two German businessmen on holiday discuss the Greek situation on their smartphones from their respective luxury hotel rooms, with dialogue consisting only of headlines that had appeared in the German press: “Sell your islands, you broke Greeks, and the Acropolis as well!”, “Nein! No more billions for the greedy Greeks. Nein! nein! nein!”, and “We have debts too, but we can repay them because we get up early in the morning and work all day!” The send-up of self-righteous Germans belittling the uppity Greeks was framed by film title cards that said, “This summer we Germans have an historic opportunity — ” followed by, “The opportunity not to behave like assholes for once.” In the midst of so much ponderous political seriousness, it was reassuring to know that at least some people in Germany had a pretension-puncturing sense of humour. At most, the Tsipras regime, supported by the old opposition parties (since their programs are now not substantially different from that of Syriza), and still enjoying a good measure of popular support, on the grounds that, “Well, Tsipras tried his best, but there was no alternative,” perhaps sees a few glimmers of twilight in the general hopelessness. It might hope that the unworkability of the new imposed deal will become apparent and lead to modifications, that the bad publicity of German bullying and the increased ideological tensions between Germany, France, and Italy will have a longer-term beneficial effect, and that the IMF admission that there needs to be enormous “debt relief” (which Syriza argued for all along) will lead to a substantially different package in the end, one that’s closer to the Keynesian call for economic stimulus made by internationally known economists like Krugman and such colleagues as Joseph Stiglitz and Thomas Piketty. Angelos is a Greek-speaking American journalist of Greek descent, and his book, finished just as Syriza was coming to office in January 2015 and published this summer, has the big advantage of actually introducing us to the ordinary people and the extraordinary landscapes of Greece. For those who want to go beyond the 15-second “streeter” interviews and the “sound bite” opinions featured on television, Angelos offers a more satisfying alternative and a story far more accessible than those worthy, informative, but hard to penetrate books about the economic contradictions of the EU and Greece. 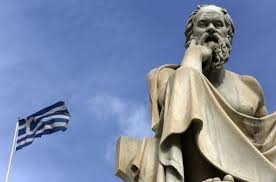 He begins on the island of Zakynthos, off the coast of the Peloponnese peninsula, where in the harbor town square there’s a statue of one of the poet-heroes active in the nineteenth century independence struggle of Greece. Angelos is here because, a few months before, at a dinner party in Berlin, he had learned about the “Island of the Blind.” It’s a place where “Greek words such as fakelaki (‘small envelopes’), the Greek slang for a bribe handed over in order to, as Greeks often put it, ‘oil’ the government machinery” are familiar. On Zakynthos, Angelos had heard, there was “a ridiculously high number of Greeks… claiming to be blind in order to collect a government disability check.” Nearly 2 per cent of the population of 39,000 — about nine times the rate of sightlessness in most of Europe — was discovered to be receiving benefit payments for blindness. Angelos tracks the scheme from the local hospital where its sole ophthalmologist diagnoses the alleged disability, to the city hall officials who sign off on the claims, to the back country residents who pocket the benefits (minus the various fakelaki, of course). In an overview introduction, Angelos offers a broad caution. When the eventual inspectors examined the Greek social fabric, they “found big problems almost everywhere they looked. A deeply entrenched tradition of political patronage meant politicians handed out social benefits to select groups in exchange for votes, while often leaving the most vulnerable to fend for themselves. Tax evasion was pervasive and Greek tax collectors frequently cooperated with tax evaders. Public workers were hired often not because of their qualifications, but because an aunt or a cousin knew a mayor or parliamentarian.” The litany was long. Angelos, who’s written for the Wall Street Journal and as a freelancer, worked and traveled in Greece during most of the period of economic catastrophe. Among his virtues is that he doesn’t appear to have an ideological axe to grind as he visits off-the-main-road communities, investigating various stories, and yet, at the same time, he doesn’t sugarcoat the tales of everyday corruption that permeate the sinews of Greek society. There’s a temptation to see Angelos’ portrait as a confirmatory documentation of a dysfunctional society, or to sensationalize the incidents of fraud and crime he recounts (as some jubilant conservative critics have done), but I think a more appropriate perspective is to see that his first-hand account of Greek life helps us understand the difficulties that any political regime faces when attempting to remedy long-standing failings. Rather than sensationalizing Greece’s failings, Angelos manages to humanize its corruption, if that phrase isn’t an oxymoron. His basic sympathies urge him to “report a story about how [the] scandals attract a great deal of attention, but say little about the average, honest Greek.” When the facts fail to lend support to such ideas, he reports that, too. Angelos covers a lot of sun-drenched territory and azure-blue waters. On the island of Hydra, he gets to the fine points of tax evasion in a seaside taverna. When the government of the day attempts to demonstrate its sincerity in shrinking the civil service by firing the entire cast at the public broadcasting corporation, Angelos reports on the broadcasters’ sit-in. 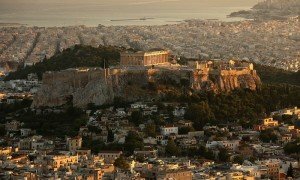 He profiles a nonagenarian national hero, Manolis Glezos, a supporter of Syriza, who became famous as a teenager during World War II for climbing atop the Acropolis and taking down the occupying Nazi flag, then successfully escaping. As he often does, Angelos strikes just the right nuanced tone about his subject, at once venerated hero and shrewd demagogue. Perhaps the most rending tale in the book is Angelos’ journey to Greece’s northeastern border with Turkey, where refugees from throughout the region attempt to ford the dangerous local river. Many of them don’t make it; Angelos eventually visits the Muslim graveyard of a nearby village where their bodies are interred. Back in Athens, Angelos devotes another harrowing chapter to the story of a neighbourhood hostile to Afghan immigrants who have turned up there, and how the openly fascist Golden Dawn organization exploits the residents’ anger. Angelos’ passage “among the new Greek ruins” is another instance where a thousand (or more) words is worth more than a single misleading picture on one of our sundry screens. 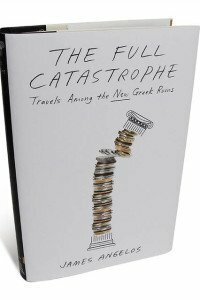 The Full Castrophe is a modest, but engaging journalist’s take; it has few pretensions to political or philosophical depth, but one comes away from its pages with a slightly better feel for the Greek reality. That’s a pretty good accomplishment in a situation where the question, Whither Greece?, couldn’t even be answered by the Delphic oracle.